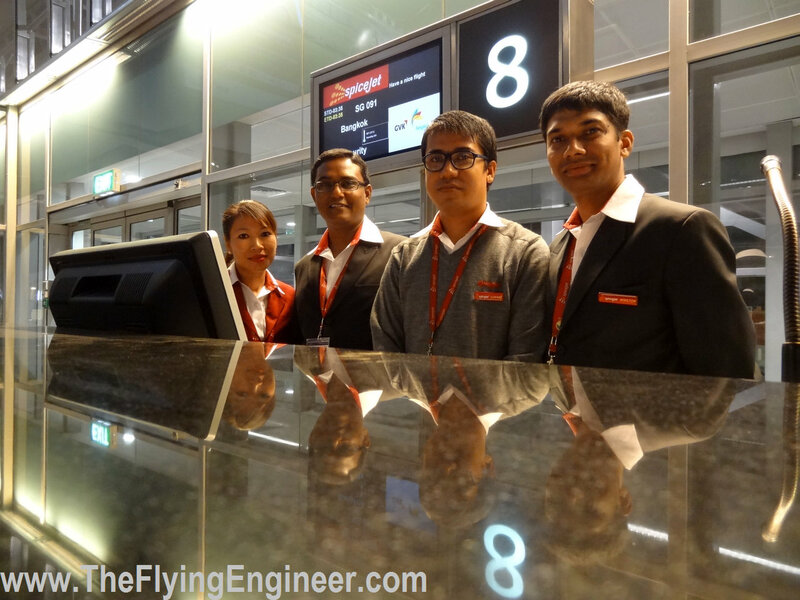 A peep into the airline, operations, and the life of some of the men and women who make the airline fly. The technical level of this article has been toned down to cater to a larger audience. Terms with superscripts in this article are explained under “Aviation Terms and Concepts” towards the end of the article. Detailed technical particulars of the flight are available under “Particulars”. When Mr. Giriprakash, Chief of Bureau, Hindu Business Line approached Spicejet’s check-in counter at Bangalore’s Kempegowda International Airport, he was received with much fanfare by the airline’s Senior Vice-President, Commercial, V. Raja, for becoming the first passenger to check in for the airline’s inaugural flight to Bangkok. —Winston and his colleagues ready to commence boarding at Gate 8, Bangalore Airport. The flight was scheduled to depart at 3:35am (2205 UTC) on the 27th of October, 2013. Winston, a senior customer service executive with the airline, responsible for the management of passenger and passenger services on ground, was excited to be behind the desk at Gate 8 of the airport. Even though it was his 5th year in the airline industry, “it’s exciting to be part of this first flight. It’s the first international destination for Spicejet, from Bangalore, so it’s a different experience! It’s not as light as a domestic departure. We have a lot of documentation, formalities, and passengers from other nationalities." The boarding of 87 passengers, which included Mr. Raja, began 30 minutes before scheduled departure time, and the flight deck crew, who were extremely busy with preparations for the first flight on the sector, arrived with just 13 minutes to spare. They had an unusual workload, which included manually feeding the route into the flight management system01, and double checking everything. First flights, especially when it’s the airline’s first international flight out of a city, have a larger share of unpredictability, and operational challenges. VT-SZC, “Asafoetida”, a Boeing 737-800 with winglets, operating as SG 91 on the inaugral Bangalore-Bangkok flight. Training and Standards. He was assisted by another senior captain, Pankaj Saxena, who also is an examiner on the NGs. The flight deck crew had a combined experience in excess of 20,000 hours of total flying experience, some of which was picked up by both crew while serving the Indian Air Force. Said Bhuvnesh, “ With two experienced examiners, there is a greater combined cockpit experience, and we benefit from each-other’s line03 experience." So why do we have a management pilot on board, today? 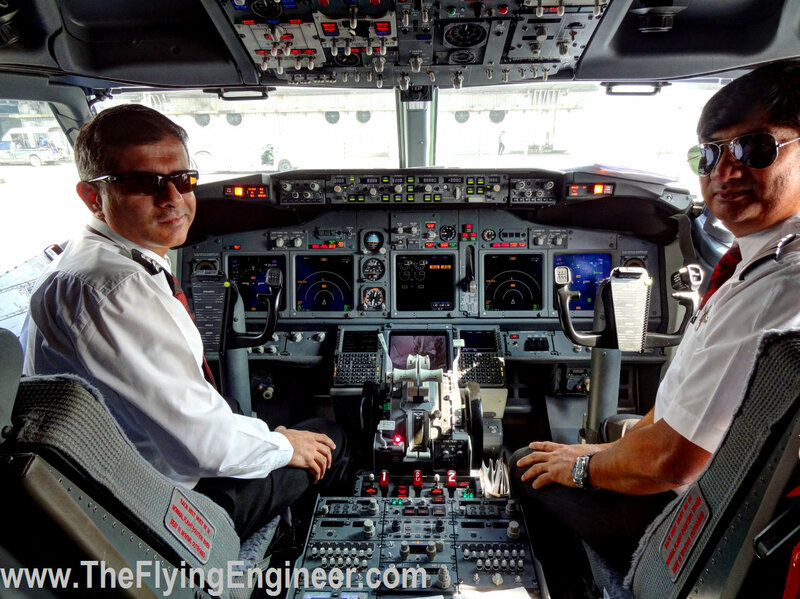 “As a management pilot, I prefer to fly on the first flight to identify areas that need improvement." Preparation for such a flight is intense. “We referred to Thailand Aeronautical Information Publications (AIP)04, to study the local procedures and airport information. Standard Operating Procedures (SOPs) were defined for this sector based on a brain-storming session with management pilots. Safety & Operational assessment of the airfield was carried out by a team that visited Bangkok before the actual flight. Engine out procedures were studied and drafted". Did he find anything special about Thailand’s procedures? “Yes! For example, noise-abatement05 procedures are in effect at Bangkok." The shortest and preferred route06 between Bangalore and Bangkok flies over Chennai, Port Blair, and Dawei in south-eastern Myanmar. Since Port Blair, which has an airport, is not operational at night, an airline flying in the wee hours of the day cannot use it as an alternate, in case of an emergency, such as an engine failure. In case of an engine failure on board a twin engine Boeing 737-800, the aircraft may, on that route, have to fly in excess of 60 minutes on the other engine, before reaching a suitable airfield operational at night. Flying in excess of 60 minutes isn’t permitted for a twin engine airplane unless the aircraft, and the airline are certified for ETOPS07: Extended Range Twin Operations. Since the airline’s applicable ETOPS operational certification is in process, the airline will, for the first 15 flights or so, use a slightly longer route to Bangkok, over Vijayawada, and Vishakapatnam, before turning east to fly over the Bay of Bengal towards Dawei, and finally into Bangkok. With such a route, the airplane is always within 60 minutes of an adequate airfield, but picks up an extra 70 nautical miles (NM)08, or 130 kilometres, which translates to about 10 minutes of extra cruise time. 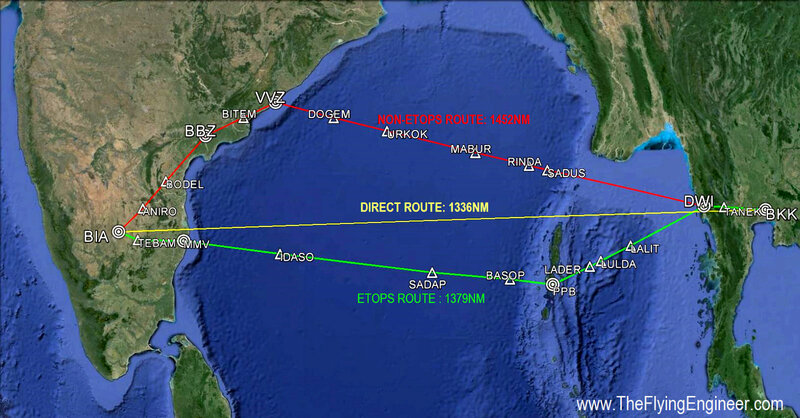 The total route distance is 1,452 NM (2,690 km). But why fly at these wee hours of the night? According to Raja, Spicejet is opening up international routes at those hours when the airplanes would otherwise be parked at an airport, as there are no domestic departures between 22:00hrs IST and 0600hrs IST. This ensures greater aircraft utilization without impacting domestic operations. SG 91 to Bangkok, operated by a 8 month young Boeing 737-800 registered09 as VT-SZC and nicknamed “Asafoetida" finally pushed back from the parking stand 55 at 03:40 IST, picking up a 5 minute delay. After engine start, the aircraft taxied to Runway 27 via taxiway10 “D". Runway 2711 is west facing, chosen as prevailing winds were blowing 6kts (11km/h) from the west. Takeoff is almost always against the wind. With a takeoff weight of 62 tonnes, which included 11 tonnes of Aircraft Turbine Fuel (ATF)12 worth approximately INR 11 lakhs (US$17k), and flaps set to 5 degrees for takeoff, the two CFM56-7B24 engines, capable of together delivering 21,700kg of thrust, spooled up to 4,720 RPM, making the tips of the 24 fan blades move at 12% over the speed of sound, resulting in small sonic booms that gives the characteristic “buzz" (that sounds like a mixer-grinder) from the engines often heard during takeoff. 13 minutes after leaving the gate, SG 91, the inaugural flight to Bangkok, was airborne at 03:52 IST. After gaining an altitude of 800 feet, the 737-800 with winglets13 banked left, tracing the arc of a circle, to head north-east towards Vijayawada. The airplane climbed like a homesick angel at 287 kts (531 km/h), which eventually touched Mach 0.77, which is 77% the speed of sound. SG 91 cruised at Flight Level14 (FL) 390 (39,000ft above mean sea level). Eastbound flights fly at an “odd" altitude, such as FL 350, 370, 390. Westbound flights fly at “even" altitudes, such as FL 360, 380, 400. This 1000ft separation between traffic in opposite directions is necessary to allow for greater traffic to be squeezed into the air traffic system, resulting in greater airspace efficiency. 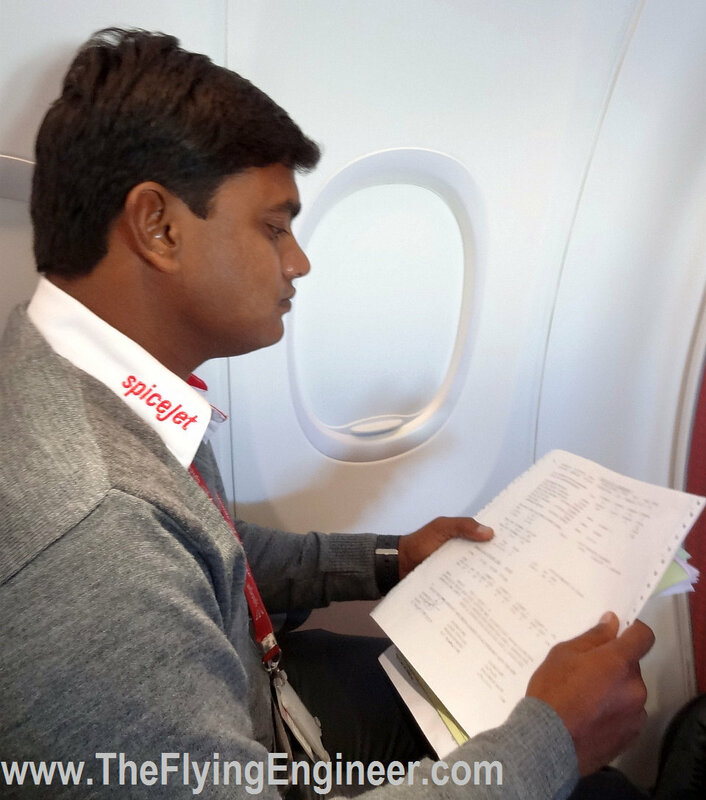 Raghu, a Load Officer with the airline, doesn’t usually fly on board, but this was no ordinary flight. He was seated on 1A, and is responsible for the weights and weight distribution in the aircraft. With the airline for over 5 years, he loves his job, and he said with pride, “Safety and fuel savings are in the hands of the load officer. If I manage to keep the centre of gravity further away from the nose of the aircraft, I save fuel for the airline". An aircraft behaves much like a see-saw. If one side is heavy, the other side must balance the forces to ensure that the see-saw doesn’t tip to one side. In an airplane, the horizontal stabilizer: the small horizontal wings at the rear of the aircraft, act as one end of the see-saw and are responsible for the balancing force. The forces on the “other end" of the see-saw is the aircraft’s weight, acting through the centre of gravity, and the hinge of the see-saw are the wings. If the weight is improperly distributed, pilots lose control over the airplane, with undesirable consequences. If the weight in the airplane, made of fuel, passengers, crew, baggage, and catering, are all well balanced, controlled flight is possible. Further optimisation is possible by distributing the weights, within limits, to ensure a better fuel performance. Passengers are weight approximated as follows: 75kg for adults, 35kg for children, and 10kg for infants. The weights include the cabin baggage. Crews are approximated to 85kg per member. The 189 seats on the Boeing 737-800 are “divided" into three compartments for the purposes of weight distribution: C1, C2 and C3. Seats 1-10 are in C1, 11-20 in C2, and 21-32 in C3. To ensure optimal fuel economy, the check-in staff allot seats based on the weight distribution preferences of the load officer. If, for some reason, the check-in staff are unable to seat to his preference, he has to work with the check-in baggage to distribute the loads. The 737-800 has two cargo compartments below the passenger floor: one forward of the wings, and the other aft of the wings. So, in the desire to load the aircraft tail-heavy, won’t the airplane tip over? “Up to 1 tonne can be loaded in the aft without risking a tip-over. Usually the forward cargo compartment is loaded first, followed by the aft cargo compartment, so a tip-over never happens!" Does the whole exercise have to be very precise? “Not really. A change in weight of 200-300kg will not have much of an impact. However, if we have a load difference in excess of 400kg, it will necessitate a re-do of the load and trim calculations"
Weather animation, as seen by weather satellites. Marked in red is the flight route, and the animation covers the weather for the period 30 minutes before scheduled departure, up to landing at Bangkok. Weather, as seen from inside. Left to Right: Weather Radar painted “red” all over; Sunrise, as seen by Capt Kalra, through thick clouds; View from the left and right passenger windows from row 1. Notice the formations. Despite flying at 39,000ft, disturbances over the Bay of Bengal had made the weather bad, and the flight a bit bumpy. The seatbelt sign was left on for a good portion of the flight, while the plane flew through massive cloud formations that were no less than 40,000ft in height. Captain Bhuvnesh had obliged to click the sunrise from the deck, but the clouds ruined what would have otherwise been a treat for the eyes: flying east into the sunrise. Tailwinds15 of 14 knots over the Bay of Bengal, near waypoint “URKOK" lent the aircraft a “ground" speed of 459kts, or 850km/h with respect to the ground. All four cabin crew busy with service. Also seen is Mr. Raja, on row 2, with a white shirt and a tie. Despite the mild turbulence, the cabin was significantly busy with 4 crew, headed by a very pleasant Subhasini Agarwal, who was the Cabin Crew in Charge (CCiC) for that flight. Over a brief chat on the differences between an international and domestic flight, she said, “There are more rounds of service, as the flights are usually longer. In addition, there is more documentation, associated with customs and immigration. Being the Cabin Crew in Charge, I am responsible for the formalities of my cabin crew members. In addition, the landing announcements are slightly different, to include the mention of the local time and day. But otherwise, it’s not too different from a domestic operation." —A good 3 inches between the knee and the next seat, for a 5ft 7″ man. 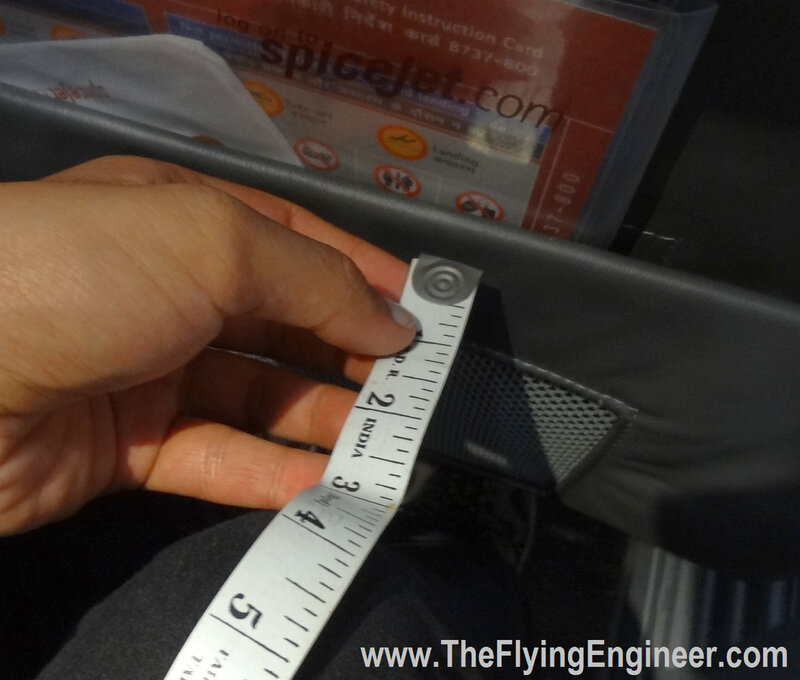 Spicejet’s cabins feature “Premium Seats" on the first two rows in the cabin: 1 & 2. On asking why these were “Premium", “The seats are closer to the lavatory, are the first to be served, and allows passengers to de-plane first". The first row enjoys the most comfortable legroom in the cabin, but row 2 on the right hand side features a 29 inch seat pitch16, which at first thought seems uncomfortable. But when a 5ft 7in tall man sits, there is a good 3 inch gap between the knee and the seat in front, which is fantastic. The seat width is 17 inches, unchanged throughout the cabin. The seat pitch in the cabin is mixed, featuring 29, 31 and 32 inch seat pitches. Many non-premium seats feature the higher seat pitches compared to premium. But in all cases, the seats are comfortable. Tip? The best “premium" seats are on the left hand side, Row 1 and Row 2, seats A, B and C.
The Boeing Sky Interiors. Notice the lighting and overhead bins. Also in the foreground: Premium Seats. The cabin on VT-SZC, just like other newer Boeing 737s in the airline’s fleet, feature the Boeing Sky Interior. 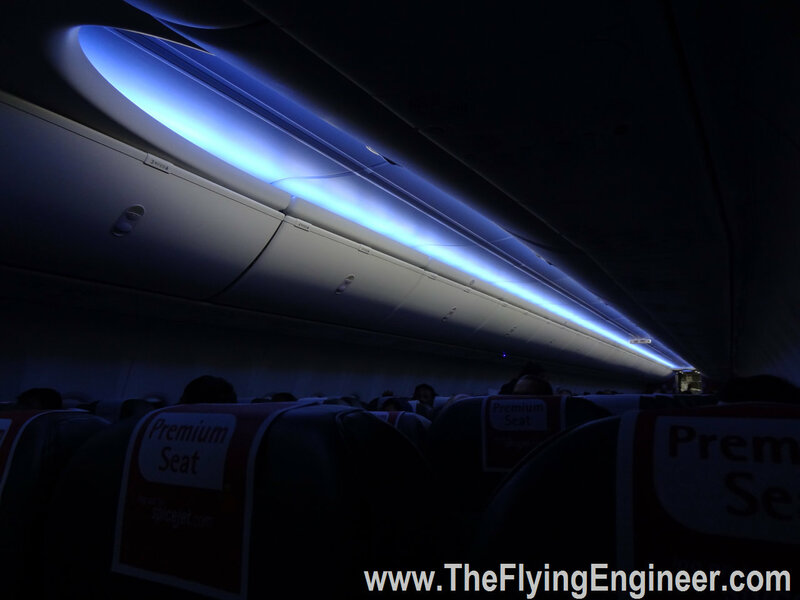 Cove lighting with soft dimming, and curving architecture create a distinctive cabin experience: a soft blue sky overhead simulated by light emitting diode (LED) lighting and a more open cabin. The overhead bins pivot up and out of the way, adding to the open feel of the cabin. Bangkok Flight Services and Bangkok Aviation Fuel Service “welcoming” Spicejet, as seen from the cockpit. Water canon salute was missing. After the cockpit crew requesting for certain deviations to steer clear of weather, and punching through unavoidable clouds, the Boeing 737-800 began its descent from 39,000ft, 3 hours after taking off from Bangalore. Air Traffic Control guided SG 91 to approach runway 01L: the left, north facing runway. Bangkok, unlike Bangalore, has two physical but parallel runways, labelling them left and right, along with the number, depending upon the direction from which the runway is approached. For the final approach, the crew slowed the aircraft to 132 knots (244 km/h), and extended the flaps found on the trailing edge of the wings to 30 degrees down. Flaps help generate adequate lift even at low speeds, and landing at low speeds is preferable in the interests of performance, controllability and safety. The airplane approached runway 01L with the help of a radio guidance system known as the Instrument landing System, or ILS. With the help of an ILS, an airplane can land all by itself in what is known as an “Autoland". Autolands are usually not performed, unless for training purposes, or when visibility is poor, and the crew, aircraft and the airport meet minimum requirements. After burning nearly 7,700kg of ATF, Captain Bhuvnesh made VT-SZC kiss the runway at Suvarnabhumi Airport, the international airport at Bangkok, at 07:30 IST (09:00 ICT-Thailand), 3 hours 35 minutes after leaving Bangalore. With thrust reversers17, spoilers18 and minimal brakes19, he brought the aircraft to a slow taxi, using up less than half of the 12,000ft long runway. He taxied to Concourse D, to stand D2, where the ground crew holding a large banner welcomed the airline’s maiden service to Thailand. One hour later, the aircraft left Bangkok, with another set of crew, to Pune, inaugurating the Bangkok-Pune service. Seated, Left-Right: Kamal Hingorani, Senior Vice President & Head, Ground Services; Anil Wadhwa, Indian Ambassador to Thailandand; V. Raja, Senior Vice-President, Commercial. Spicejet held a press conference 1hr 45 minutes after landing. Kamal Hingorani, Senior Vice President & Head, Ground Services, and V. Raja flanked Anil Wadhwa, Indian Ambassador to Thailand. 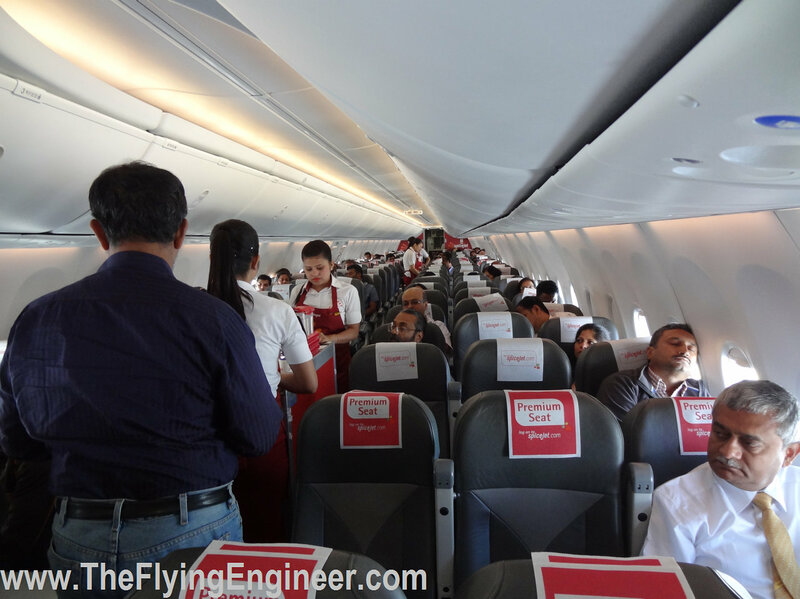 Spicejet’s maiden flight into Bangkok marks the 10th International destination for the airline, the only Indian airline to fly to Bangkok from Bangalore, and the first international flight for the airline out of Bangalore. The airline has an ongoing promotional fare of just INR 8,000, all inclusive, for travel between the city pairs. In the press conference, V Raja said the airline will add two more foreign destinations during this fiscal — Dammam in Saudi Arabia, and Kuala Lumpur. It will bring the total number of foreign destinations it operates to 12. 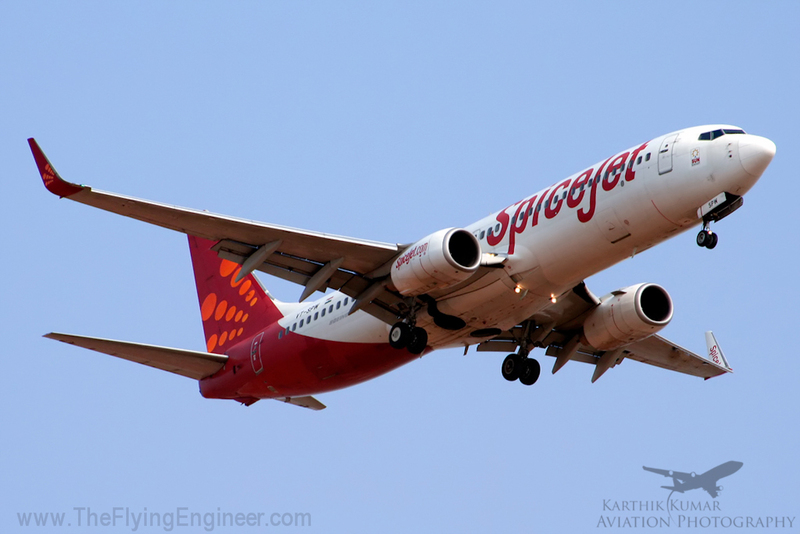 Vipul Seth, the General Manager, Business development at Spicejet, mentioned the airline’s practice of replacing older Boeing 737s with newer ones, which has brought the average fleet age to 2.5 years. The airline has entered into a lease agreement with Singapore-based BOC Aviation for six Boeing 737-800s. The airline has a fleet of 55 aircraft including 15 Bombardier Q400s which are fully owned. Spicejet, as is known to most, commenced operations in mid 2005: a little more than 8 years ago. An interesting revelation is that the airline traces its roots to Modiluft: launched by the Indian industrialist S K Modi, in technical partnership with Lufthansa, in 1993. The airline, which had set records of sorts, ceased operations in 1996, changed hands, was renamed Royal Airways, and in 2004, again changed hands to become Spicejet, which, according to the airline, is “India’s Most Preferred Airline". Bhuvnesh Kalra: Type Rating Examiner (TRE) and Deputy Head of Training and Standards. Captain Kalra has been “airborne" since 1990, and has flown the MiG 21, MiG 29 and the Sukhoi Su-30 MKI when serving the Indian Air Force. He left the Air Force in 2004, due to personal reasons. 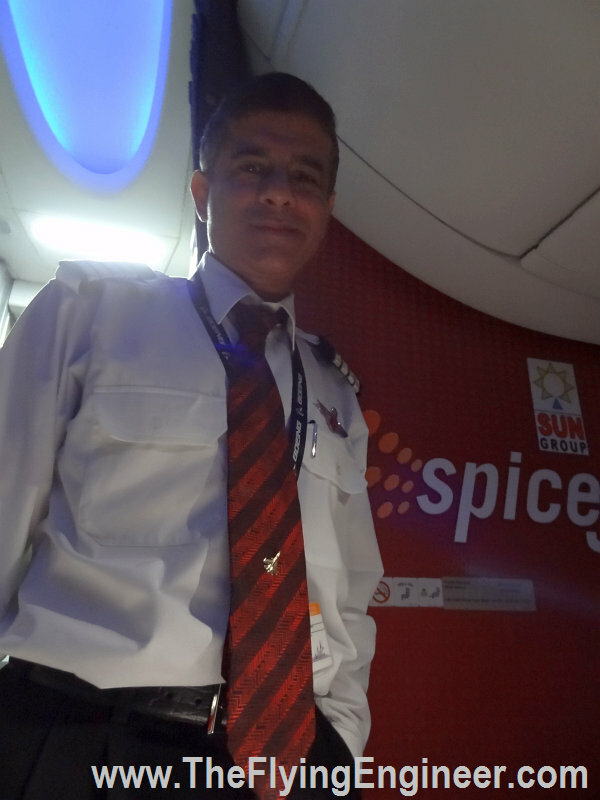 He joined commercial flying in 2005, when he joined Spicejet, which he has been with since the start of operations. Over 8 years, he has accumulated about 7,000 hours on the Boeing 737NG. On the thoughts running through his head as he commands the aircraft towards Bangkok: “My mind’s blank, I’ve got no special thoughts running through my head". Blank mind, so did he get enough rest? He replied, laughing, “Ha ha, I’d have to kill you if I told you!" With a wink, “Yes, I did get good rest before this flight!". And what does he think of civil flying, in the light of his military service? “The excitement factor is low. I can’t really push limits as safety is paramount. In military flying, the mission takes a higher importance, so limits can be pushed. But that can’t be done when 189 passengers are behind you. It’s like comparing apples to oranges. Very different." The best thing about flying? “It does not get monotonous at all. Every day is different; the weather is different." , said Kalra while adding that he “Loves enjoying the view out of the cockpit.". Does he love being a management pilot? “I’d prefer line flying as there’s more flying. Being involved with the management, I have more paper work and desk related jobs." Talking of paper work, does he prefer paper charts or the i-Pad? “I’m old school, and I prefer paper charts. But I also do realize the value of an i-Pad and its benefits: for example, searches are easier, and whole document collection is lighter to carry around." And finally, what do you like about Spicejet? “Good working environment, with nice people around. It’s fun to work here, and very satisfying." 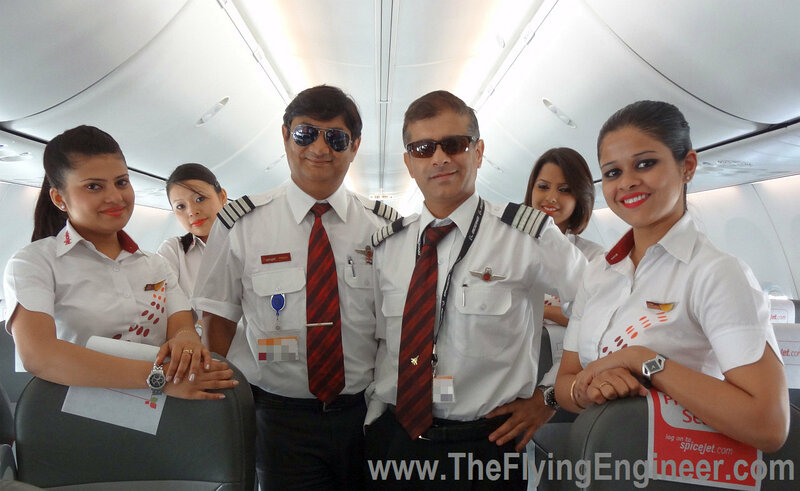 Subhasini Agarwal: Cabin Crew in Charge. “I love to meet, greet and interact with different people! 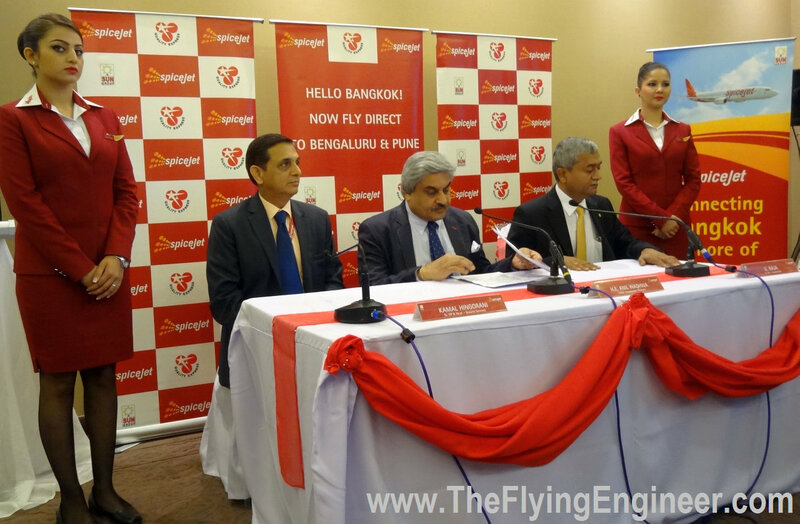 ", says Subhasini Agarwal, Cabin-Crew in Charge for the inaugural flight from Bangalore to Bangkok. “The bug bit me when I was 9, and flew from Kolkata to Bhubaneswar with my parents". Following her passion, Subhasini pursued Hotel Management, and worked with Kingfisher as Cabin Crew for 6 months before moving to Indigo. After spending 5 years with the airline, she quit, got married, and has now joined Spicejet as Cabin Crew in Charge (CCIC). As a CCIC, she leads three other Cabin Crew on board. Getting to that coveted post in the airline takes years. The career starts with the position of a Trainee Cabin Crew, promoted, after about 6 months, to Cabin Crew. Depending upon experience and performance, but with no hard timelines, Cabin Crew are promoted to Senior Cabin Crew. After serving for 4 years as Senior Cabin Crew comes the coveted position of leading the cabin as a Cabin Crew In Charge. A 189-seat cabin of the 737-800 has people from various backgrounds and cultures. Shubhasini feels that managing the cabin, co-ordinating with the other cabin crew, and carrying out the service, in the light of this is challenging. Being the lead cabin crew, when a situation new to her suddenly pops up, there is no-one to get help from, at 37,000 feet up in the air. “Learning how to manage new situations on the spot through effective communication, and cutting across varied mental wavelengths", are to her, challenges that provide opportunities to develop herself. “Emergency situations and their resolution interest me a lot". That rewarding moment? “When people leave the airplane, with a smile", knowing that she and the crew that’s managed this flight have performed well, yet another day. Her thoughts on the first flight? “I am pretty excited about the layover at Bangkok!" She’s thankful both to her supportive husband and Spicejet, for being in the rewarding position that she enjoys today. “I can see myself doing this for a year or two, before I decide to grow my family", after which, juggling between a mom, a home-maker, and a cabin-crew member who may be away from home for more than a day could prove to be undoable. What then? “A management position in the airline, perhaps!" ILS / VOR-D / Visual? ILS-DME by which acft had established ILS? 01 Flight Management System: An electronic system on board the airplane that manages the performance and navigation of the flight, based on a database. It interfaces with the autopilot to allow the airplane to “fly itself" along the programmed route, with minimal pilot intervention. Usage of the FMS results in tangible fuel savings through flight parameter optimisations. 02 737NG: A Boeing airplane that has become a bestselling aircraft model, and includes the 737-600, 737-700, 737-800 and the 737-800 variants. NG stands for “Next Generation". The 737-800 can seat up to 189 passengers in a single class, 6-abreast configuration, and has a fully-loaded range of 3,115NM with winglets. Maximum takeoff weight for the type is typically 79,000kg. 7755 Boeing 737 aircraft have been produced, all variants of the Boeing 737, both out of production, and in production, combined. 03 Line Flying: Term used to describe scheduled, regular flying in an airline. 04 AIP: (Aeronautical Information Publication): a state publication issued by or with the authority of a state and containing aeronautical information of a lasting character essential to air navigation. 05 Noise Abatement Procedures: Flying procedures and techniques that are to be followed to ensure reduced noise levels around airports. 06 Air Route: A route defined in the AIP that describes the “virtual highways" in the sky that must be strictly followed unless permitted. Routes are so designed as to ensure airspace efficiency, safety, and availability of radio reception from ground stations for navigation. 07 ETOPS: Extended Range Twin Operations: Early apprehensions about the reliability of engines prohibited twin (two) engine airplanes from flying beyond 60 minutes from any available airfield, to facilitate a flight on one engine should the other fail. With increased reliability of engines, flights “extending" beyond 60 minutes of an airport are permitted, subject to certification of the operator (airline) and the aircraft-engine combination. Flights beyond 90, 120 and 180 minutes, and more of a suitable airport are possible under these rules. Applicable for flights over vast stretches of land (desert) or water (oceans, seas). 08 Nautical Miles (NM): 1.852 km, also defined as the distance between one minute of latitude, or one minute of longitude at the equator. 09 Registration: Every aircraft must be registered with the local civil aviation authority, much like the registration of vehicles with the local state authority. All airplanes registered in India start with a “VT-“ registration, followed by 3 letters that are unquie to the particular aircraft. 10 Taxiway: The “path" on which an aircraft moves along the ground from the runway to the parking stand / terminal. 11 Runway numbers: Every physical runway has two directions. The magnetic orientation of the runway, as measured off a compass in degrees, is divided by 10 to arrive at the runway number. For example, a runway oriented along 270 degrees magnetic is Runway 27, and hence the opposite direction, facing east or 90 degrees, is runway 09. Similarly, a runway oriented along 10 degrees faces north-north-east and is labelled runway 01. 12 Aircraft Turbine Fuel: Jet fuel is a colorless, combustible, straight-run petroleum distillate liquid. Its principal uses are as jet engine fuel. The most common jet fuel worldwide is a kerosene-based fuel classified as JET A-1. Has a flash point higher than 38 °C (100 °F), with an autoignition temperature of 210 °C (410 °F). 14 Flight Level: The “level" at which the aircraft is flying, based on the altimeter and an assumed, standard altimeter pressure setting of 1013.25 HPa. 15 Tailwinds: Winds that blow in the direction of the aircraft’s flight and push the airplane forward, resulting in higher speeds as measured with respect to the ground. Opposite of Headwinds. 16 Seat Pitch: The distance between a point on a seat, and a similar point on another seat either ahead of, or behind the reference seat. 17 Thrust Reversers: A system available on most engines that redirects the engine thrust to achieve retardation as opposed to acceleration. 18 Spoilers: Surfaces on a wing that rise up, increase aerodynamic drag, and result in aircraft retardation. 19 Brakes: Wheel brakes, similar in concept to those on automobiles. Usually found only on the main landing gear under the wings / belly of the airplane. Excellent Article….Although not part of the Flight, reading through the article provided a good experience!! Pity SpiceJet seems to have discontinued BKK route after only 3 months of operations. Even the Bangalore-Bangkok flight has been cancelled now. So this means that SG has no flights to Bangkok at all.